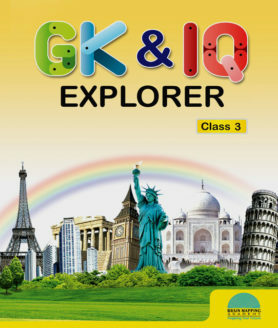 GK & IQ Explorer series quenches the learner’s thirst for knowledge, keeps them ahead in day-to-day advancements in various disciplines and ensures active participation of the learner and prepares him to face the competitive world with confidence and achieve success. Presented in simple language to facilitate easy understanding. Provided with multi-color pictures to induce curiosity. Presented with Snippets to highlight some important facts. Provided with help-box to assist the learner in answering the questions. Includes chapters on modern testing techniques and methodologies. Provided with answers for each chapter at the end of the book. Includes formative and summative assessments. Enhances general knowledge & awareness in the learner.